British world heavyweight champion Tyson Fury has been told by the sport's authorities not to make "controversial non-boxing comments". He was warned over his conduct by the British Boxing Board of Control after a meeting on Tuesday. Fury, 27, apologised after making comments about women and gay people. Almost 140,000 people signed a petition calling for Fury to be removed from the BBC Sports Personality of the Year shortlist before December's event. The Manchester fighter, who outpointed Wladimir Klitschko to become heavyweight champion in November, caused controversy over derogatory remarks he made about women, and for criticising homosexuality and abortion. A BBBC statement said Fury's comments had "caused offence" but that he had not broken the law by "exercising his right to freedom of expression" and it could not "interfere with his basic human rights". 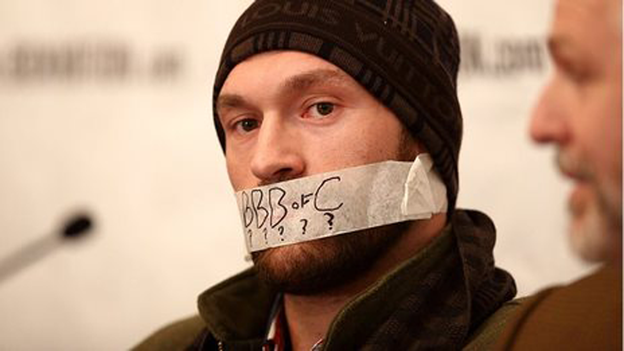 It added: "The stewards of the board have made it clear to him [Fury] that as world heavyweight champion, arguably the holder of the most prestigious title in sport, there are heavy responsibilities upon him to avoid making controversial, non-boxing comments. "He has assured the stewards that he understands the responsibilities upon him and has expressed regret that he has caused offence to others, which was never his intention."